On Tuesday night of last week, a 5 alarm fire broke out at a nearly 100-year-old abandoned Bridegport warehouse on the Southside of Chicago near Ashland and 37th. Smoke was initially spotted by a fire department battalion chief passing by the former Harris Marcus Group building at 3757 S. Ashland Ave. shortly after 9 p.m. and called it in. Extra alarms were quickly called as the fire spread throughout the 4 story warehouse causing the roof and three walls of the 200-foot by 200-foot structure to collapse as crews fought the flames. The fire was particularly difficult to battle in 10-degree temperatures as more than 170 firefighters, one-third of the Chicago Fire Department’s on-duty personnel, contended with frozen hydrants, icy ladders and gear covered with frost and ice as they worked the scene. The fire was finally brought under control around 12:30 a.m.
After firefighters cleaned up the scene and continued searching for hot spots on Wednesday, the water from the fire hoses and the frigid temperatures created amazing ice formations on the brick walls of the warehouse, utility lines leading up to the building, street lights surrounding the exterior, vehicles abandoned in the parking lot, the bridge in front of the building and virtually anything else that came into contact with the overspray from the multiple lines used to fight the fire creating an “ice castle” appearance for the gutted warehouse and surrounding structures. The fire that smoldered for hours into Wednesday afternoon rekindled Thursday morning, almost a day and a half after prompting the largest fire department response in seven years. Firefighters had expected the fire to rekindle in areas where the roof and floors had collapsed. The Fire Department also deployed a piece of equipment from the 1960s dubbed “Big Mo” that can shoot 2,000 to 3,000 gallons of water a minute from two turrets that can be fed by as many as 10 water lines. This special deluge unit which doesn’t get much action these days helped the CFD get the fire back under control for the second time. Due to growing concerns about the warehouse collapsing, demolition of the building in the 3700 block of South Ashland Avenue began Friday morning, though fires continued to burn inside. As the demolition crew removed sections of the outer walls, periodic flareups were seen as oxygen was introduced into the various void spaces where fire is still burning underneath the debris. Sadly, I wasn’t able to make it out to the building during the fire or before the demolition crew had started to tear it down, but I still managed to make it there on Saturday to catch a few interesting shots of fire crews spraying water on the smoldering hot spots, the cool ice structures they created in the process and the removal of a box truck from the back of the building that was totally encased in ice. I ended up taking hundreds of photos while I was there and I’m currently in the process of sorting through my favorites. Since I have so many, I think this will require multiple days to post all the ones I like but here’s a few to get things kicked off. 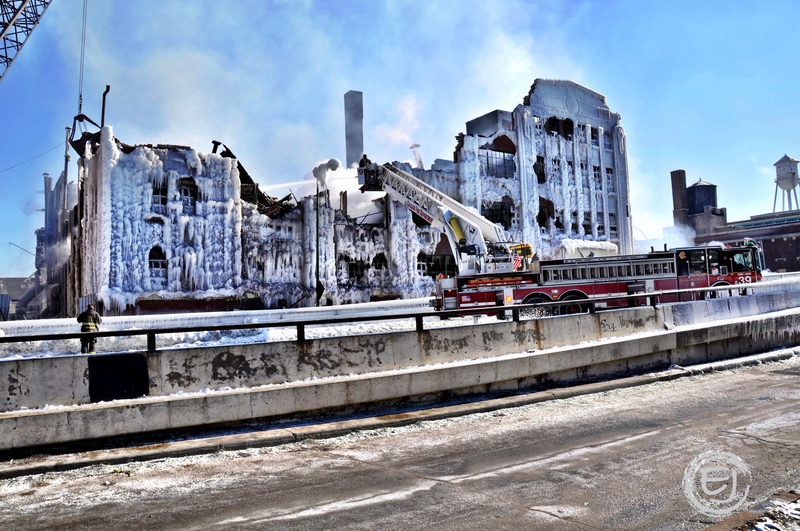 This entry was posted in Chicago, Fire Department, Firefighters, HDR, Life, Weather and tagged bridgeport warehouse fire, ice castle, Warehouse fire. Bookmark the permalink.